With the change of seasons comes a change in the way you groom. Believe it or not, summer isn’t as carefree as one would hope when it comes to your skin, hair, and beard. You need to make adjustments to avoid damage, irritation, and discomfort. If the sound of this makes you nervous, don’t be. Though you need to change around a few products, it’s nothing you can’t handle. During summer, you spend a lot of time outdoors. You get sweaty and dirty (and sand-covered depending on where you are). You need a hairstyle that’s modern but low maintenance. The hottest months of the year aren’t great timing for growing your hair to rock star lengths. The most summer appropriate style is the buzz cut. However, not every guy has the face shape or level of comfort with chopping off almost every strand of hair he has. In that case, go for a style that keeps your hair above your neck and off your forehead. Think classic styles like the pompadour or the brushed-up top with short sides. If you want something trendy, try an undercut with shaved sides. 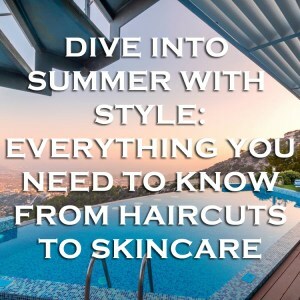 Concerning care, the biggest threat to your hair this summer is chlorine. If you spend any time in the pool, make sure you take some extra precautions. Chlorine chemically bonds to your hair and can cause long-term damage if it isn’t washed out. Take a quick shower before you hop in. It takes longer for chlorine to soak into wet locks. And hopefully you are carrying a good bag with some shampoo inside. You should lather up thoroughly when you’re done to get that harmful stuff out. Our Guilford Tote is the perfect summer carry all. When summer rolls around, it’s time to update your skincare products. You might use a heavier cleanser during the colder months. Colder air forces you to take extra precautions and safeguard your face against chronic dryness. However, when moisture returns to the air, a heavy cleanser can cause your sebaceous glands to work double time. Basically, your face will become an oil slick, and your pores could become easily clogged, leading to acne. Switch to an oil-free cleanser for the season and let Mother Nature’s moisture work its magic. The other key is sun protection. Prolonged sun exposure can bring on some serious skin issues: premature wrinkles, peeling, sunburn and irritation, skin cancer. No guy wants to experience any of this. Your best bet is a sunscreen with an SPF of at least 30. If you’ve got a beard, you need to continue the same care routine you’ve followed the rest of the year. Unlike your skin, the change in moisture outdoors will have little effect on your beard because it’s already moisture-deficient. You should use a dime-sized dab of beard oil each morning. After swims or time at the beach, you should reapply to keep your beard hair from getting dry and brittle. Keep a small bottle of oil in your Yale Messenger so it’s always within reach when you need it. And as a bonus, your whiskers provide a little extra sun protection for your chin and cheeks. There’s no doubt summer can be a fun time. Keep your life easy with some minor adjustments to your hair and skincare.